A new study finds asking Facebook users about publishers could "be quite effective in decreasing the amount of misinformation and disinformation circulating on social media" — but Facebook will need to make one important change to its plan. David Fahrenthold of the Washington Post won a Pulitzer for his Trump coverage, but he couldn’t have done it without help from his readers. In the first episode of our new podcast, Pull up a Chair, David talks with NYU’s Jay Rosen about the power of putting readers at the heart of journalism. An awesome little start of a podcast. I’d definitely come back to this. Since the beginning of January, I’ve come back to regularly browsing and using the website Rap Genius. I’m sure that some of the education uses including poetry and annotations of classics had existed the last time I had visited, but I was very interested in seeing some of the scientific journal article uses which I hadn’t seen before. Very quickly browsing around opened up a wealth of ideas for using the platform within the digital humanities as well as for a variety of educational uses. Users can use not only text, but photos, video, and even audio to supplement the listings. Built-in functionality includes the ability to link the works to popular social media audio services SoundCloud, and Spotify as well as YouTube. Alternately one might think of it as VH1’s “Pop-up Video”, but for text on the Internet. Ultimately the site expanded to include the topics of rock, poetry, and news. 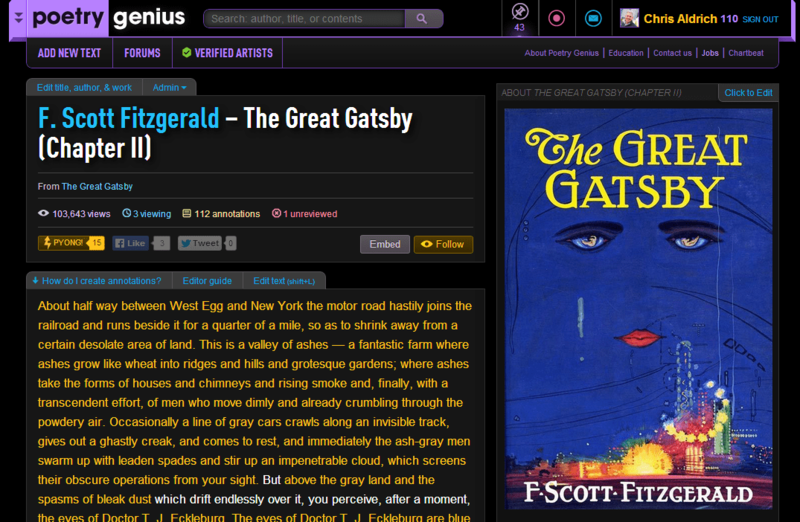 The rock section is fairly straightforward following the format of the rap section while the poetry section includes not only works of poetry (from The Rime of the Ancient Mariner to the King James version of The Bible), but also plays (the works of William Shakespeare) and complete novels (like F. Scott Fitzgerald’s The Great Gatsby.) News includes articles as well as cultural touchstones like the 2013 White House Correspondents’ Dinner Speech and the recent State of the Union. Ultimately all of the channels within Rap Genius platform share the same types of functionality, but are applied to slightly different categories to help differentiate the content and make things easier to find. Eventually there may be a specific “Education Genius” (or other) landing page(s) to split out the content in the future depending on user needs. On even its first blush, I can see this type of website functionality being used in a variety of educational settings including Open Access Journals, classroom use, for close readings, for MOOCs, publishing in general, and even for maintaining simple-to-use websites for classes. The best part is that the ecosystem is very actively growing and expanding with a recent release of an iPhone app and an announcement of a major deal with Universal to license music lyrics. To begin with, Rap Genius’ YouTube channel includes an excellent short video on how Poetry Genius might be used in a classroom setting for facilitating close-readings. In addition to the ability to make annotations, the site can be used to maintain a class specific website (no need to use other blogging platforms like WordPress or Blogger for things like this anymore) along with nice additions like maintaining a class roster built right in. Once material begins to be posted, students and teachers alike are given a broad set of tools to add content, make annotations, ask questions, and provide answers in an almost real-time setting. Given the rapid growth of the MOOC-revolution (massively open online courseware) over the past several years, one of the remaining difficulties in administering such a class can hinge not only on being able to easily provide audio visual content to students, but allow them a means of easily interacting with it and each other in the learning process. Poetry Genius (aka Education Genius) has a very interesting view into solving both of these problems, and, in fact, I can easily see the current version of the platform being used to replace competing platforms like Coursera, EdX, Udacity and others in a whole cloth fashion. Currently most MOOC’s provide some type of simple topic-based threaded fora in which students post comments and questions as well as answers. In many MOOCs this format becomes ungainly because of the size of the class (10,000+ students) and the quality of the content which is being placed into it. Many students simply eschew the fora because the time commitment per amount of knowledge/value gained is simply not worth their while. Within the Poetry Genius platform, students can comment directly on the material or ask questions, or even propose improvements, and the administrators (the professor or teaching assistants in this case) can accept, reject or send feedback request to students to amend their work and add it to the larger annotated work. Fellow classmates can also vote up or down individual comments. Typically with the average poem or rap song, the commentary grows slowly/organically and is edited along the way. In a MOOC setting with potentially hundreds of thousands of students, the commentary is like a massive fire-hose which makes it seemingly useless without immediate real-time editing. Poetry Genius may need a slightly different model for using their platform in larger MOOC-style courses versus the smaller classroom settings seen in high school or college (10-100 students). In the particular case for “The Letters of Paul,” if the course staff had gone into the platform first and seeded some of the readings with their own sample commentary to act as a model of what is expected, then the students would be a bit more accepting of what is expected. I understand Dr. Nasrallah and her teaching assistants are in the system and annotating as well, but it should also be more obvious which annotations are hers (or those of teaching assistants) to help better guide the “discussion” and act as a model. Certainly the materials generated on Poetry Genius will be much more useful for future students who take the course in future iterations. Naturally, Poetry Genius exists for the primary use of annotation, while I’m sure that the creators will be tweaking classroom-specific use as the platform grows and user needs/requirements change. In my mind, this type of platform can easily and usefully be used for publishing open access journal articles. In fact, one could use the platform to self-publish journal articles and leave them open to ongoing peer review. Sadly at present, there seems to be only a small handful of examples on the site, including a PLOS ONE article, which will give a reasonable example of some of the functionality which is possible. Any author could annotate and footnote their own article as well as include a wealth of photos, graphs, and tables giving a much more multimedia view into their own work. Following this any academic with an account could also annotate the text with questions, problems, suggestions and all of these can be voted up or down as well as be remedied within the text itself. Other articles can also have the ability to directly cross-reference specific sections of previously posted articles. Individual labs or groups with “journal clubs” could certainly join in the larger public commentary and annotation on a particular article, but higher level administrative accounts within the system can also create a proverbial clean slate on an article and allow members to privately post up their thoughts and commentaries which are then closed to the group and not visible to the broader public. (This type of functionality can be useful for Mrs. Smith’s 10th grade class annotating The Great Gatsby so that they’re not too heavily influenced by the hundreds or possibly thousands of prior comments within a given text as they do their own personal close readings.) One may note that some of this type of functionality can already be seen in competitive services like Mendeley, but the Rap Genius platform seems to take the presentation and annotation functionalities to the next level. For those with an interest in these types of uses, I recommend Mendeley’s own group: Reinventing the Scientific Paper. A Rap Genius representative indicated they were pursuing potential opportunities with JSTOR that might potentially expand on these types of opportunities. Like many social media related sites including platforms like WordPress, Tumblr, and Twitter, Rap Genius gives it’s users the ability to self-publish almost any type of content. I can see some excellent cross-promotional opportunities with large MOOC-type classes and the site. For example, professors/teachers who have written their own custom textbooks for MOOCs (eg. Keith Devlin’s Introduction to Mathematical Thinking course at Stanford via Coursera) could post up the entire text on the Poetry Genius site and use it not only to correct mistakes/typos and make improvements over time, but they can use it to discover things which aren’t clear to students who can make comments, ask questions, etc. There’s also the possibility that advanced students can actively help make portions clear themselves when there are 10,000+ students and just 1-2 professors along with 1-2 teaching assistants. Certainly either within or without the MOOC movement, this type of annotation set up may work well to allow authors to tentatively publish, edit, and modify their textbooks, novels, articles, journal articles, monographs, or even Ph.D. theses. I’m particularly reminded of Kathleen Fitzpatrick’s open writing/editing of her book Planned Obsolescence via Media Commons. Academics could certainly look at the Rap Genius platform as a simpler more user-friendly version of this type of process. I’m personally interested in being able to annotate science and math related articles and have passed along some tips for the Rap Genius team to include functionality like mathjax to be able to utilize Tex/LaTeX related functionality for typesetting mathematics via the web in the future. Naturally, there are a myriad of other functionalities that can be built into this type of platform – I’m personally waiting for a way to annotate episodes of “The Simpsons”, so I can explain all of the film references and in-jokes to friends who laugh at their jokes, but never seem to know why – but I can’t write all of them here myself. Interested users can easily sign up for a general Rap Genius account and dig right into the interface. Those interested in education-specific functionality can request to be granted an “Educator Account” within the Rap Genius system to play around with the additional functionality available to educators. Every page in the system has an “Education” link at the top for further information and details. There’s also an Educator’s Forum [requires free login] for discussions relating specifically to educational use of the site. Are there particular (off-label) applications you think you might be able to use the Rap Genius platform for? Please add your comments and thoughts below.